Have you ever wondered what it would be like to mentor a new hunter who is a millennial (someone who is between the ages of 23 and 36)? Are you worried that you might be too different from each other to have a successful experience? Well, I have news for you… they are just like you…except different! Why do you hunt? The Wildlife Management Institute has found that the most common reasons the average hunters goes out, is for the sport, to be with family/friends, to be close to nature, and most of all for the meat they take home. It turns out; millennials want to hunt for the same reasons, for the meat, to be social, and to spend time in the outdoors. With like motivations, you are already off to the start of a successful mentoring experience. Although you have like motivations, one hunter may approach things from a different view than another hunter. The millennial may not have played in the outdoors like you did. They might jump when an owl hoots or a squirrel barks. They need help writing or re-writing their outdoor identity. Someone like you is just the person to help him or her do that. Many millennial hunters do not yet have the support or institutional knowledge that goes with hunting and shooting sports. They are going to need someone to invite them and encourage them along in the new journey they have embarked on. When mentoring a new hunter, make sure to keep things simple. 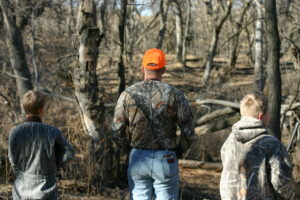 Many young hunters are prepared for homework and are eager to gain from your knowledge and experience. Make sure to focus on the clean-kill ethic and the ethic of utilization, especially food, when you are hunting. Respect your differences with the ideas about what animals to harvest and politics, especially gun politics. Make time to learn about your mentee, who they are, what they want to learn, and what concerns them. Remember, we do not want to mentor a new hunter just so they become another license buyer. We are not necessarily looking to create another hunter that looks and acts exactly like us. We want to mentor a new hunter to help create a new generation of hunting and shooting sport ambassadors. I challenge you to ask someone new to go out hunting with you and I guarantee you won’t be let down by the amazing experience ahead.